The ticket price includes entry and one drink per person (a glass of wine, a beer or a soft drink). 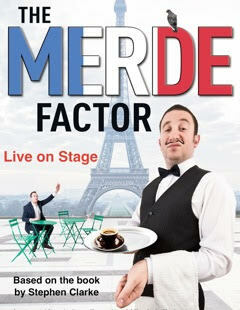 The Merde Factor, Stephen Clarke's stage adaptation of one of his best-selling "Merde" novels. As part of WICE’s 40th birthday celebrations, come along to this exclusive event for WICE members and their guests. Englishman Paul West (played by a stand-up comedian fresh from London) rants about France to the audience, and interacts with a series of comic characters – male, female, French and otherwise – played by one (pretty heroic) actress. Their antics are accompanied by a live musician who pitches in with ditties like "I need a euro, a euro is all I need", "La Vie en Merde" (to replace "Rose" of course), and "Bonjour, is it moi you're looking for?" (with profound yet insincere apologies to Lionel Richie). The plot: Paul is penniless, living in a chambre de bonne above a neighbor with Tourette's syndrome, and about to be ripped off by his former boss. His only option: to get one of the few jobs for life left on the planet, as a French civil servant. Meanwhile he agrees to be a judge in a competition: "Has Paris Got Literary Talent?" (Answer: non). 90 minutes of jokes, anecdotes, accents, songs and very bad poetry. This exclusive performance will start at 7:00pm and finish at 8:30pm. After the show there will be a question and answer session with Stephen Clarke, followed by a book signing.